I am guilty. Wore heels to the airport. I was on my way to Vegas though! Great advice! I’m not much of a heel girl, only because I’m running around like crazy on campus. Most of this is common sense, but you’ll be surprised how many people just are clueless. 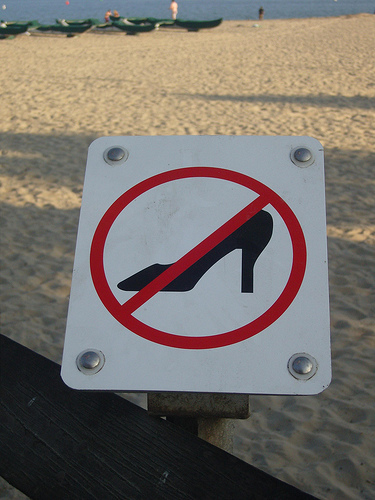 You’d be surprised how many girls I see running around in heels on my college campus. And it is full of hills! Crazy! Agreed on the PJs and sweats. I trust your fashion advice because you are a shoe girl like me. 🙂 Wedges and shorter heels = acceptable. I can’t agree more with you on the airport one. Every time I see a woman teetering through the airport I can’t help but judge. You have either never flown before or you are an idiot.